A VLE is a blend of Video, Written, and Audio Communication to produce lessons, coaching, feedback and evaluation to students that may not be able to attend a traditional classroom. The VLE is student centered. In order to determine if this learning method is effective for the Martial Arts industry I will compare the advantages and disadvantages of this teaching method. Then I’ll look at who might be a good candidate for this learning approach. I believe the biggest advantage to a VLE is the access to good information. Throughout a Martial Artist’s career one may infrequently find themselves without a place to train or an instructor. Occasionally groups of students have lost their instructor and found themselves looking for help. A Virtual Learning Environment allows the student the option for continued training when the need arises. This method could also be used as an additional resource if the student wanted to learn extra-curricular lessons that are not provided in their current learning environment. For example; as a brown belt I wanted to understand more about ground fighting which was not emphasized at the studio I attended. I purchased a few videos on the topic to help further my knowledge base. Another point in favor of VLEs is for students that leave the training environment temporarily due to job relocation or other life issues. The VLE provides an avenue to keep training. In many Arts it takes, as little as, two years to achieve a Black Belt. What if a student starts at age sixteen? Right around the time he/she is about to get their Black Belt they are also about to go away to college. Should they choose between getting their Black Belt and furthering their academic education? A teacher could continue their training with a virtual learning environment. VLEs stimulate students to dig for information and practical examples. This forces students to be creative and responsible for their learning. A well-structured VLE can provide idea sharing. The Martial Arts Learning Community (TheMALC) trains together annually. This allows distance learners an occasion to collaborate on projects and provide feedback to each other. DVDs of various projects are presented for evaluation and comment. This is a wonderful way to further the participant’s knowledge base, build a sense of community, and allow an isolated student to train with a group. The disadvantages of VLEs include technological issues, dependency on a potentially unresponsive instructor, a requirement for clear communication, lack of training partners, absence of a regular evaluation process, and a lack of community provided by the studio environment. Technological issues range from e-mail constraints to software/hardware failure. I’ve personally experienced not being able to watch a DVD lesson because it was formatted for different equipment. I’ve also had trouble sending or receiving images or videos through e-mail and, I experienced communication issues with Skype. There seems to be infinite ways for my equipment to fail or challenge me. You need a combination; a strong instructor, coach or consultant who understands the VLE well, and a highly motivated student, for a VLE to be effective. There must be clear communication between you and your instructor to make distance learning work. Written material, such as terminology and manuals will assist with accurate and effective communication. My biggest concern with any Martial Arts VLE is the evaluation process. In a traditional setting, your instructor is watching you, frequently making corrective adjustments as you go. Without those corrective adjustments you may be forming bad habits, and training that way for an extended period of time. Another downside is the lack of community. Being part of a club, or a school, provides a healthy sense of competition and can reinforce positive qualities in us like empathy, a desire to encourage others, and the potential for lifelong friendships. Lastly, you may have a lack of training with partners in a VLE. To make your Art work, you need to train with other bodies. This helps you practice the “Martial” in the Art, to experience if your training is paying off. Training partners also provide encouragement and motivation when you are going through a difficult time. Your sense of loyalty to your training partners may help you get off the sofa, and go train. For a VLE to work, both the student and the instructor will need to labor on the required technological skills. The VLE student must take greater ownership for their Martial Arts education; they can no longer simply show up for class. This method of training will require increased self-motivation to stay focused and progress. The student and the instructor will be obliged to work on all varieties of communication in order to successfully understand the lesson and to communicate any issues concerning performance. Completing assignments and training the required exercises has always been the student’s responsibility. If a student is unwilling to accept greater responsibility for the lesson, this will be more noticeable in the VLE environment. The VLE instructor or coach must be highly motivated to participate in the more structured virtual learning environment. Instructors already have the responsibility of providing clear lessons to their students. In a VLE, they will also have to alter their traditional methods of communication in order to effectively give the lessons and evaluate progress. The instructor will have to take more responsibility, keeping in touch with the students on a regular basis, to ensure quality communication. It is more demanding to maintain the student/teacher relationship through long distance learning. The instructor will need non-traditional methods to evaluate, and improve the student’s movement and understanding. Effective communication between the instructor and student will help each evaluate skills, fitnesses, personalities; this kind of mutual understanding can only help motivate both participants. This is a lot of work for the instructor; there can be no hiding lack of communication skills behind rank or office. They must be willing to reach out to the student and to be available to the student outside of the scheduled class times. The instructor must be creative when providing feedback and lessons to the virtual student. VLEs require good Martial Arts basics and good language skills. Consistent, well defined terminology, providing clear understanding of concepts, is a required component that ensures effective communication between student and instructor. What a nice challenge! In conclusion, I am an advocate of VLEs. A virtual learning environment can be effective in martial arts training, if done properly. I do not promote video lessons as the only form of learning. I do not support the on-line black belt courses that do not involve several in-person lessons, evaluations, and ongoing dialog between the student and his instructor(s). As I have illustrated here, many factors need to be considered when creating a VLE. I feel this is a helpful tool for a well-focused, skilled student, a motivated group of students, or a long term student going away temporarily. VLE methods can also benefit a student looking for additional learning resources. 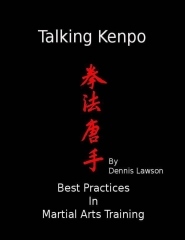 Look for more information in my E-Book “What’s Missing in Most Martial Arts Virtual Learning Environments?” coming soon.